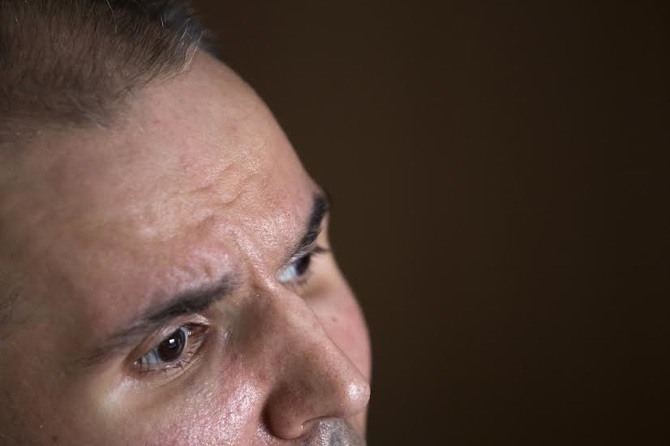 For six years, Răzvan has not been able to speak and barely moved. His mother hopes that with proper care she can offer him a dignified living. On Ciacova Street in Bucharest’s 1st district, time has grown old and mellow. Houses peek through the network of overhead wires, cars wait quietly on the curb, hesitating between the sidewalk and the road. Gabriela Zăinescu, a 59 year old woman with electric red hair and a bright smile, is on her daily commute to her second home: a senior nursing home where her 37 year old son has been staying since 2012. She enters the courtyard, gives warm hellos as she leaves behind garden statues, geranium pots, and a sweet smell of freshly cooked food, and rushes to the pavilion where her “baby” is staying. Until recently an economics and philosophy teacher at a high school in Bucharest, Gabriela boasts the kind of energy that could animate even the most inert planet in the universe. Inside the pavilion, a long hallway stretches toward Răzvan’s room, near the end and on the right. As she steps into the room, a warm light floods her face. She walks to him and kisses his forehead. “My baby, are you glad mommy’s here?” she tells him, rustling a plastic bag with yogurt jars and fruit puree. Răzvan is lying in bed, hands crossed on his chest, and fingers clutched as if he’d want to make a fist. His eyes are dark and piercing, and his lower lip is deeply bitten, two scars in the corners of his mouth. A nurse lifts him into a sitting position, leaning him against a couple of pillows. Under the bed sheet there’s a pneumatic mattress, with air pressure increasing and decreasing at constant intervals. It’s meant to prevent bedsores, lesions that can eat the flesh to the bone, if immobilized for a long time. Gabriela washes her hands, then comes back and opens a yogurt jar. The spoon is plastic, to make sure it doesn’t hurt him. Yogurt, cottage cheese and a bit of cappuccino are the only foods she has given him since March this year, when, with very slow movements, he started regaining his deglutition reflex, meaning swallowing. The rest of his diet is delivered via PEG – percutaneous endoscopic gastrostomy –, basically a tube that passes through the abdominal wall, and runs mashed food and medicines directly to the stomach, bypassing the mouth and throat. For almost six years, Răzvan has been artificially fed because he’s in a permanent vegetative state, triggered by a cardiac arrest followed by a long coma. The causes of the “generalized convulsive arrest”, as the 2008 admission file explains it, are still uncertain. Since then, he has been almost entirely immobilized. He couldn’t speak anymore, and his vision remained severely damaged. After complex therapies, he managed to utter a couple of vowels and slightly move his head and limbs. But neurologists say this progress is mere reflex – he is not able to consciously interact with his environment. Throughout these years, Gabriela’s life has changed dramatically. Beside the pain of seeing her son completely helpless, she has to provide him with proper long-term care. That is, she has to pay a team of specialists comprising at least a speech therapist, a kinesiotherapist, a masseur, and a psychologist, beside the nurse who feeds and bathes him daily. The expenses go far beyond the average Romanian family income. But she hopes that, with multiple therapies, Răzvan will regain a state of minimum consciousness, despite the doctors’ grim prognosis. The vegetative state has concerned the medical world for a couple of decades. A result of resuscitation procedures, it represents, paradoxically, an unfortunate side effect of the improvement of emergency medicine. The first observations have been made on patients who overpassed the critical state of coma, but didn’t voluntarily interact with the environment after “waking up”, leading to the conclusion that they lack “self-consciousness”. Later, the term “waking coma” was adopted, but was abandoned because of its contradiction: patients in a coma never open their eyes. In 1972, a paper written by a Scottish neurosurgeon and an American neurologist introduced the term “vegetative state”, based on the fact that the patients’ vegetative nervous system remains, in great part, functional. That is, everything we can’t consciously control in our bodies is still working: the cardiovascular, gastrointestinal, genitourinary, and visual systems, and thermoregulation. Later, “persistent” was added, since the state can extend over a long period of time. After a couple of months in a persistent vegetative state, the patient can evolve to a state of minimum consciousness, or stagnate. For the latter, “persistent” becomes “permanent”. Few countries clearly distinguish between the two terms, and the confusion sometimes occurs among health professionals. The USA protocol notes that, in case of non-traumatic brain lesions, the diagnosis can change to permanent after three months in a persistent vegetative state. In Great Britain, the verdict follows after six months. The label ‘permanent vegetative state’ doesn’t mean the patient will never give signs of recovery, but in countries like Great Britain or the US it opens up the possibility of asking in court for the removal of the feeding and hydration tube. A new discussion arose in 2010, when an article in the British magazine BioMed Central brought up what the medical world and especially the families of patients had felt for over 30 years: that the term “vegetative” hurts their dignity. Since “to vegetate” means to lead a purely physical existence, “without intellectual activity or social interaction”, the word becomes depreciating, the patient being perceived as a vegetable. Moreover, recent neuroimaging studies have shown that the state of consciousness can’t be evaluated as it was in 1972, when doctors decided on its presence or absence based on behavior observations, writing that the patients “remain with their eyes closed for a long time”, “sometimes seem to be sleeping”, “sometimes blink, but it’s not to be said they are alert”. This ambiguity led to diagnosing errors, and the media has exposed some vexing cases. For instance, that of the American writer Julia Tavalaro, who suffered two strokes in 1966 and, after waking up from a coma, remained almost completely paralyzed, unable to speak for six years. Thanks to complex therapies she regained the capacity to communicate, and with help of a friend wrote the book Look up for Yes, in which she describes the ordeal she went through in hospital, being called a “vegetable” although she was conscious and experienced strong emotions. Recently, the term „unresponsive wakefulness syndrome”, or UWS, has been proposed. The focus shifts on the patient’s moment of awakening, leaving out the interval and the ambiguous notion of consciousness. This new term is meant to change the views of doctors and care givers who, more often than not, see these patients as hopeless. This is also because, for years on end, they have been considered “vegetables” that either crowd intensive care units, or don’t respond with spectacular results to costly therapies. But “results” and “spectacular” mean different things to doctors and families. If any apparently minor gesture gives hope to loved ones, in the hospitals’ administrative offices the numbers are clear-cut. “There, you’ve had something to eat today. Now mommy will give you some water”, Gabriela whispers as she looks on the nightstand for the syringe she uses as a dropper. Up on the wall, to the left of the bed, a collage of tens of photographs, cut out and pasted, restores pieces of Răzvan’s life as in a modern film. (It’s a 30th birthday present from his sister, Ruxandra, who lives in France.) As a kid, Răzvan had a brilliant mind and always looked for something new to discover. Sometimes his father, George, scolded him for being superficial, “but I knew,” his mother remembers, “that he understood, and wouldn’t stay on the beaten path”. In high school, Răzvan was ambitious, intelligent, with sharp critical thinking, but also a big heart. “There was something tender about him, and he managed to get everybody to like him”, says his old friend Roxana. He was an energy bomb. Ernest, a friend who once helped him paint his apartment, remembers the poster in his room saying: „Winners never quit, quitters never win”. For him, Răzvan was the “perfect big brother”. He never gave up, and in college he integrated perfectly in the “workaholic generation”, another friend says. In 2000, after graduating business school, he went to the US with an AIESEC program, to work at MasterCard in St. Louis, Missouri. As he prepared for an MBA, he took a GMAT test where he scored 780 out of 800 points. The day he learned the results, he called his parents to tell them he was going to one of the best universities in the world. The same evening, his father had the first seizure announcing a galloping brain cancer. The following year was difficult for the entire family. They all kept hoping that maybe, eventually, he would defeat the illness, but it didn’t happen. The news of his father’s death fell hard, so Răzvan decided to not go back to the US. He wanted to stay with his mother and sister, and take care of them. In Romania, he worked for Reuters, Oracle and Deloitte. At the time of the accident, he was about to be accepted to the MBA. Gabriela says he still receives e-mails with proposals from Stanford, UCLA, and Berkeley. In the photographs, Răzvan is a kid at the seaside, wears a best-in-class crown, laughs out loud, or stands by Raluca, his wife-to-be. He loved her madly, and they got married in June 2008. Until December, they made plans for the future: a home, an apartment to suit their taste, and children, two boys and a girl, or a boy and two girls. Nothing forebode the tragedy that followed at the end of the year. Maybe just one episode, which neither they nor the doctors knew how to interpret. She could tell something was wrong, and thought of a car accident. – Is he still alive? Răzvan has been resuscitated for 40 minutes, and after six adrenalin shots his heart started beating again. He was in critical condition, so they transported him to the Emergency Hospital in Cluj, and admitted him to the Anesthesia and Intensive Care (AIC) unit. Gabriela took the first plane to Cluj. “We were each trying to help as we could”, says Cristi, a good friend. “We cancelled all New Year’s Eve plans, and gathered at Raluca’s parents, hoping he’ll get better.” After the MRI tests, Răzvan was diagnosed with post-hypoxic coma, with lesions on his brain (at the base of the forebrain, near the basal ganglia, and in the parietal lobe). The oxygen levels in his body had dropped severely during the seizures, and Răzvan fell into a coma. The University Clinic in Munich announced them that Răzvan had been accepted for a four-month admission. They were hoping that, after new investigations and therapies, his brain would reactivate. Regarding recovery, medical opinion is rather reluctant. Chances depend on the extent of the cerebral lesions and the patients’ age – the young have a better start in regaining motor functions, but not necessarily for perception abilities, behavior and speech. A 1994 report published in the Journal of Neurology, Neurosurgery, and Psychiatry, which analyzes patients’ evolution in the course of a year, shows that, out of those who were in a vegetative state for one month after the accident, 54% regained consciousness, while 28% died, and 18% remained in the same state. But in the case of non-traumatic lesions (caused by a stroke or hypoxia), only 14% regained consciousness after a year, 47% died, and 39% remained in the same state. After a year in a persistent vegetative state, a patient’s chances to become conscious are very low, and in case it should happen, he would suffer major disabilities. There is no evidence of spectacular recovery, and no doctor speaks of great progress. Of those in a minimum state of consciousness, the March 2014 revision of the Merck Manual – the world-renowned medical textbook – says that their state tends to improve up to a certain point, but results are better in the case of patients who suffered traumatic lesions. “We barely know what’s going on in the brain when it’s functioning normally,” says Radu Țîncu, an AIC doctor at the Floreasca Emergency Hospital in Bucharest. “What could we say about when it’s adrift?” The methods for bringing the brain to a minimum state of consciousness can be grouped into: drug therapy (with documented reactions to antidepressants and dopamine), surgery (rarely, because the procedure is invasive), physiotherapy, and a couple of stimulation therapies (sensory, through music, or touch). He worked daily with a speech therapist that would massage his face muscles, and helped him utter his first vowels. Lifting him upright with the help of various contraptions and setting him on the bed’s edge, to relearn how to sit, also worked. Răzvan regained muscle strength, and got rid of spasms. Also, his limbs and head were moving more fluidly, and during kinesiotherapy exercises he was slowly starting to show some resistance. Also of great importance, the family received psychological support for overcoming the suffering. “It feels better to talk to somebody from the outside, because we each have our own pain”, says Gabriela. “Me as a mother, Raluca as the woman he loved but now didn’t recognize, Ruxandra, who in 8th grade lost her father and now her brother…” Taking turns, Gabriela and Raluca accompanied Răzvan at the daily therapies, read to him, and walked him outside in a wheelchair. Each and every day. They were prepared for the long battle called neurologic recovery. In Bucharest, friends were feeding on “success stories”. Some watched The Diving Bell and the Butterfly, an adaptation of the French journalist’s Jean-Dominique Bauby memoir. At 43, he suffered a stroke and was left with locked-in syndrome. He woke up from a coma after 20 days, fully conscious but almost completely paralyzed – except for his head, eyes and eyelids. For four hours a day, a nurse would repeatedly recite the alphabet to him, Bauby would blink to signal the letter he wanted, and she would transcribe the letters to form words and phrases. The book took almost 200.000 blinks; writing down a word took about two minutes. Two days after the book launch, Bauby died of pneumonia. As impressive as the French journalist’s story may be, the clinical evidence is ruthless: MRIs clearly show that in vegetative states the brain activity is low. Răzvan kept repeating the tests, but progress was barely visible. His brain looked “very old”. After Munich, they took him to the University Clinic in Bydgoszcz, in northern Poland, for another two months of recovery therapy: infrared light, cryotherapy (using very low temperatures), physiotherapy, speech therapy, median nerve stimulation (a therapy applied with good results in the US and Japan), massage, psychotherapy. Gabriela became more confident after talking to professor Wagner, the head of the recovery unit. He told her that in his long experience he witnessed some incredible cases. His brother in law, left inert for seven years after a stroke followed by hypoxia, has had an impressive recovery. He doesn’t speak seven foreign languages but four, doesn’t work with the public but does secretarial work and translations. The Polish clinic also proved to be a wonderful learning opportunity for Răzvan’s mother and wife, who needed to know how to take care of him after returning home. Moreover, with additional payment, the clinic’s kinesiotherapists and speech therapists did extra work with Răzvan. The day would start at 7:30AM, when together with the nurses or residents they would bathe him and get him dressed. At 8:00AM breakfast was served: cooked and pureed food, delivered via PEG. Then the medication, dissolved in water. Next were the magnetotherapy sessions (working with magnetic fields to improve blood flow in the brain), and cryotherapy (exposure to very low temperatures to strengthen the immune system). Between 11:30AM and 1:00PM Răzvan would be in physical therapy. The kinesiotherapist turned him from one side to the other, helped him lean on an elbow and move his stiff hands. After lunch and a short break came the speech therapy. In the evening, after dinner, he was being walked outside in a wheelchair, got a massage and was put to bed. In July 2009 he came back to Romania, where Raluca and Gabriela had to get accustomed to the infrastructure chaos – starting with day one, when they realized their building lacks a wheelchair ramp, and the elevator is too narrow. Since there are no specialized centers for neurologic recovery, or well-trained personnel, they decided it would be best to take care of him at home, and continue the therapies with different specialists. They were lucky to meet missus Luci, a former nurse in the AIC unit in Câmpulung, recommended by a friend of Răzvan. She had retired two years before, but wanted to continue working and was impressed by his condition. “I took care of him as if he were my own child, and I believe he felt my attachment to him,” she says. 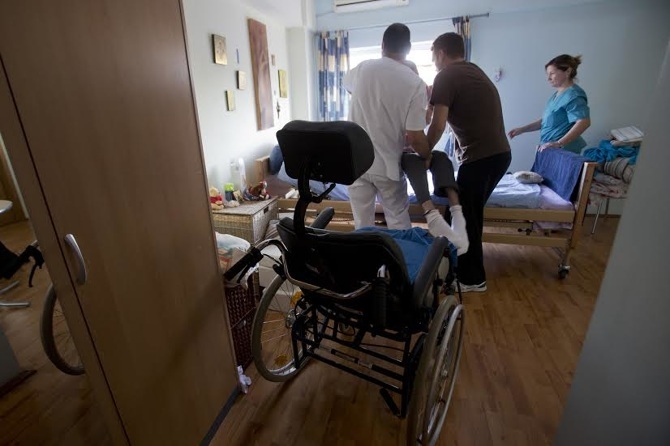 “There was a connection between us, even though doctors say he’s not conscious.” With help from Gabriela’s sister, who works in a hospital in Germany, his room had been furnished as in a hospital, with a special bed and pillows, a wheelchair, a Bobath exercise table, prostheses. Throughout the years, Gabriela understood that patients with severe neurological damage require a complex recovery program, for both body and spirit, and that each day can bring some progress. But where in Romania? The lack of specialized centers and the permanently disorienting national healthcare system turn the “flow” of patients with chronic conditions, those in a neurovegetative state especially, into agony. There is no official record with data about these cases, but their number is estimated at 12.000 yearly – and, as emergency care evolves, it keeps rising. First, they remain in intensive care units; after vital functions are stabilized, they should start the neurological recovery. Some hospitals have specialized units, but the patients need a minimum autonomy to work with the equipment because there aren’t enough caregivers to permanently assist them. However, patients in a vegetative state are fed through PEG, and usually have undergone a tracheostomy – a surgical procedure where a small plastic tube is inserted in the trachea to allow breathing. Since they can’t cough, they need somebody to suction secretions every few hours. Thus, most of them don’t stand a chance of recovering – the mortality rate is at 70%, a year after the cerebral lesion (at least double than in other European countries). There is no place in the world with unlimited healthcare resources. But “better work management and more careful support of families who are desperately fighting on their own would bring great improvement”, says Dan Alexianu, an anesthetist with 40 years experience in AIC. In 2011, the Romtens foundation has run a project for developing the abilities and know-how of healthcare specialists involved in the recovery of patients in vegetative states, financed through the European Union’s Human Resource Development Operational Programme. For two years, doctors, nurses and kinesiotherapists have attended trainings and conferences organized in partnership with the Cycloton Research Center – Coma Science Group and the University Hospital in Liège, Belgium. The main topic was financial and human resource management. Some Romanian doctors got to observe it first-hand, in a study visit to Liège. 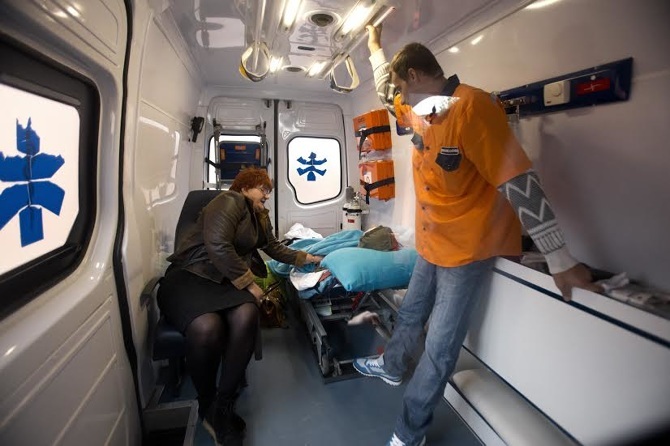 Daniela Pavelescu, an anesthesia and intensive care specialist at the Floreasca Emergency Hospital in Bucharest, says it was important to come into contact with a system that found solutions for these patients. Currently in Romania, she adds, there are no means for transfer to neurologic recovery centers. Patients end up crowding AIC units, without receiving proper care. It was September 2009 and almost a year had passed since Raluca and Gabriela were looking for treatments, trying therapies, and sending letters to hospitals abroad. They kept in touch with Ruxandra, who was studying abroad – although she initially wanted to stay next to her brother. But her mother didn’t want her to miss this opportunity, and convinced her to go. For Răzvan’s sake, every drop of hope was worth the effort. They took him to Constanța for hyperbaric therapy – based on inhaling pure, highly concentrated oxygen –, and Gabriela remembers how, when they took him out of the ‘diver’s room’, he said “mom” and “Ralu” (it never happened ever since). They lived moments of joy but also countless worries, always wondering for how long the money will last. They needed another 5.000 Euros in the spring of 2010, when they took Răzvan to the hospital in Liège for neurologic tests. The answer came after three weeks: permanent vegetative state. Up until then doctors only talked about post-hypoxic coma, ranking him on different levels on the Glasgow scale – three, five, six points (a healthy person gets 15). One of the main ethical concerns regarding neurologically damaged patients is their incapacity to communicate. By definition, those who are unconscious or in a minimum state of consciousness can’t consent to continuing the treatment, being artificially fed or being subject to scientific research. Usually, family members or legal representatives give a written consent, but there is no way of knowing if their decision is what the patient truly wishes. Some countries are now discussing the need to add this option to personal healthcare cards: if and how many times does the person want to be resuscitated in case of an accident. The neurovegetative state is caused by loss of neurons which, according to current scientific knowledge, will not regenerate. This is why some doctors claim that keeping neurovegetative patients alive is unfair, because those resources could benefit patients with higher chances of recovery. Others believe their being alive is a moral obligation, because of the state’s ambiguity. These ideas are also subject of movements that talk about “the right to die” when there’s clinical proof that recovery is impossible. In November 2011, Răzvan was living at Gabriela’s place, together with missus Luci. He and his wife had separated a year before, and Raluca only visited him a couple of time ever since. She’s in tears when she talks about him: “He was the most wonderful man I’ve ever met, he had the biggest heart.” At his mother’s, missus Luci continued to take care of him, following all doctors’ instructions. To friends, “the barrel-chested, joyful and lighthearted man” was now unrecognizable. They were also happy to see some reactions – a blink, a tear, a yawn, a sneeze –, but the line between conscious actions and reflex acts is extremely fine. Most of the times, doctors suspect loved ones of makebelieve. In August 2012, Răzvan was admitted to the senior nursing home. Missus Luci needed a longer leave, and Gabriela’s health weakened, being diagnosed with depression and prediabetes. It was the best decision at the time. “At least I knew someone is feeding him, bathing him, walking him outside every now and then,” Gabriela says, disheartened because he misses precious therapy opportunities. She did her best to bring specialists to the home, but every session costs money. “The system? What could the system do for me?,” Gabriela asks in dismay, as she puts the expenses with Răzvan on paper: 6.500 Lei per month, most of them covered by Răzvan’s former company’s foundation; his pension and disability aid only amount to 1.400 Lei. The Romanian National Health Insurance Fund covers expenses for up to 90 days of home health care, but no long-term therapies. “I don’t know if it’s fair to say that I love him more now than before, but when I’m with him I feel like a truly good person,” Gabriela says wringing her hands. She was 22 when she had Răzvan, and she feels as if they grew up together. She was his philosophy and economics teacher in high school, a play mate on the basketball court. Sometimes she “cries her eyes out” thinking of the pulsating life outside, sometimes she sees herself walking with him in the park, arm in arm. This year in early October, Gabriela decided to move him to another nursing home, one with neurology, gerontology, and psichology specialists. She’s thankful for managing to find him a roomier and brighter place. “The sun is with him all day, it’s quiet, and they’ve explained to me that Răzvan is married to his illness. I have to accept that, and respect his needs.” Moreover, it soothes her to know a psychologist will read him from his favorite books every day. It was a crisp morning when the ambulance came to Ciocova street. Gabriela walked from the subway station on Jiului Bd., carrying a bag with a blanket and other things for Răzvan. She looked tired. Walking through the courtyard, she seemed to be trying to organize his move with mere nods. On the way to his room she met the nurses and kinesiotherapists, who were waiting for her in the hallway. Few words were spoken. They incouraged her, and wished her all the best, “God willing”. Gabriela went into the room, and, as usual, kissed her son’s forehead and caressed his head. Răzvan was lying in bed, wearing a khaki sweatsuit. “My baby, we’re moving to another home,” she whispered, placing two stuffed toys under his hands. The room seemed empty without the photo collage, without the drawings and small icons Gabriela had taken to the other place the day before. “It breaks my heart to see him like this,” she said, mostly to herself, as she left the room. The ambulance driver and a bearer laid him on a stretcher, tucked him in, and slowly carried him to the car. “The mother sits in the back, with Răzvan,” Gabriela answered, and got on the ambulance. * Originally published in the December 2014 issue of DOR magazine. This story is part of the journalistic program “Viitor la purtător”, organized by DOR and ING Asigurări de Viaţă.